Based in Carentan in the département of Manche this firm was operating the winter months only service on the route from Carentan to Carteret in 1971. In the summer months the service was by rail, whilst in previous winters the bus service had been operated by STN, the principal operator at the time in the département. This route has had a somewhat chequered history and was revived with the new departmental manéo network in 2007 as ligne 108 between Carentan and Portbail but had been discontinued by July 2010. This operator, based in Domfront in the Orne, ran two routes. 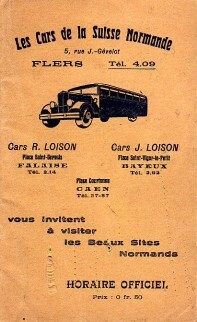 Their original 'local' route (running by 1935) was a circular service through the Canton de Passais. A summer 1942 wartime timetable from the Normandie regional edition of the Indicateur Chaix shows Gustave Lebossé running twice a day run around the circular route of 60 kilometers but with extended running time of some three hours. The Chaix issue of July 1953 shows the Passais route extending to Le Teilleul two days a week. The Passais route was joined in September 1968 by another much longer route taken over from the STN, which went from Domfront through Mortain to Avranches. Previously, from at least 1935 until some time after 1954 this Avranches route was operated by M. Gilard of Domfront; STN took it over by latest 1961, probably earlier. (There had been a rail service between Domfront and Avranches via Saint-Hilaire-du-Harcouet on which the passenger service was withdrawn on 18th July 1939, but reinstated during the war from 6th October 1940 to 1946). Whilst the bus routes mentioned no longer operate, there was still a passenger transport operation from the old Lebossé address in Domfront in 2007 under the Mayen'Voyages name. Operating from Villedieu-les-Poeles in the south of Manche, Villain et Cie were in 1969 providing several market services from their home town, as well as the principal route north-east to Saint-Lô and a schools route to Coutances. The Saint-Lô route had been previously operated by Les Courriers Normands, and in earlier years (until 1957) there was a considerable network of routes radiating from Villedieu operated by STDM (Société de Transports Départementaux de la Manche). Villain et Cie continued in operation with coaches and lorries until 1990 when a new coaching business Villedieu-Evasions was established from the same address: Route de la Foulerie at Villedieu. This operation is under the direction of the Gautier family who are also in business as Gautier Voyages of Saint James. In 2011 the business became VSJ Evasions (Villedieu St James). Voyages Lechanteur of Périers in Manche are long established coach and holiday operators with over sixty years experience, founded in 1951 and still very much in the tourism business today. In 1969 they were operating market day services from Cérisy-la-Salle to both Saint-Lô and Coutances, whilst the main bus service was from Périers to Saint-Lô. This had been taken over from Les Courriers Normands of Caen. This service (since September 2007 operating as manéo ligne 109), as well as various other schools services, continued to operate. The company is a member of the REUNIR grouping of independent transport companies. In February 2011 the Lechanteur business was bought by Collas of Bricquebosc and Tourlaville (Manche). The regular bus link between Périers and Saint-Lô was lost in July 2012 with the reorganisation of the manéo routes across the département, but Lechanteur remains a contracted operator within the new departmental network, primarily on ligne 9 from Valognes through Périers to Coutances. A substantial and long established regional operator, founded in 1934, and still in business today as part of the Transdev group. Two timetables and maps are illustrated, dating from 1938 and from 1954, thanks to the collection of James Bunting. (NB these are large files - allow time for them to download). Currently ninety per cent of the activity is in the département of Yonne including the urban networks of Auxerre, Sense, Joigny and Migennes. Nine long distance routes are operate in Yonne today and also a line in neighbouring Nièvre. School routes and tourism are important activities too, and with a fleet of 140 vehicles and an annual mileage of 2.5 million, some 3.5 million passengers are transported each year. The range of routes included in the booklet link all three of the towns just mentioned with Caen, as well as other services from Flers to Mayenne, Flers to Alencon, Domfront to Falaise, Caen to Carentan via Bayeux, and Bayeux to Grandcamp. Caen is linked to Falaise by three different routes. A second timetable dated 1934 is also illustrated, including routes from Caen to Flers and Mayenne; Flers to Alencon via Bagnoles; and Domfront to Falaise via Bagnoles. No further information is available but all of these routes (except Flers to Mayenne) were being operated by Les Courriers Normands by 1938. A considerable rationalisation of both routes and operators in the département of Calvados had taken place in 1937.